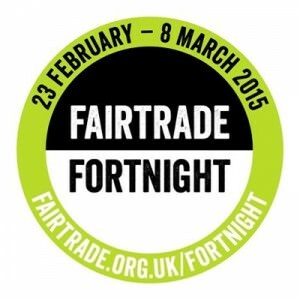 This year Fairtrade Fortnight runs from the 23rd February to the 8th March 2015 and we are celebrating the impact of Fairtrade by turning the spotlight on the producers who grow the products we love. Take for example, farmer-owned Fair Trade nut company, Liberation Foods who source all their nuts from co-operatives of small-scale growers and farmers who own a 44% share of the company. 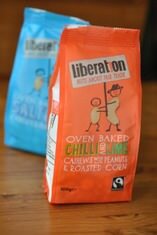 With peanuts coming from Nicaragua and Malawi and cashews all the way from India, Liberation is passionately nuts about Fairtrade, the livelihoods of its farmers and providing the best tasting product. Oven Baked Chilli& Lime Cashews with Peanuts & Roasted Corn. Inspired by the colour and flavour of street food in Latin America, the sweet cashew nuts are coated in a special chilli and lime seasoning and oven baked slowly. The peanuts are lightly salted and baked. Once the nuts are perfectly seasoned they are mixed in with the chilli corn kernels to create the perfect blend of citrus and spice. Oven Baked Salted Cashews & Peanuts. Each ingredient is baked separately with just the right amount of sprinkled salt (that stays on the nut) to produce the perfect ‘crunch’. Liberation knows that peanuts need just a little bit longer under the heat than cashews and when all are perfectly bronzed, the nuts are cooled before being mixed and bagged. Oven Baked Mixed Peppercorn Peanuts with Cashews & Habas Fritas. These hot, spicy mixed peppercorn coated peanuts are speckled with ground peppercorns, packing a real peppery taste! Not forgetting the Habas Fritas, these broad beans have been deep fried and seasoned with salt to create a crispy, crunchy and golden roasted snack. To win answer this simple question in the form below. Liberation Foods is a farmer owned what company ? You can learn more about Liberation Fairtrade Nuts by clicking here. Sound delicious, new to the site, going to have a good nose around. Thanks, Hope you like what you find!